Discussion in 'Stock 2011 - 2019 Ford Explorer Discussion' started by huskerroo, August 2, 2011. I searched and couldn't find anything specifically addressing my question...please direct me to the chatter if I missed!! We have three kids, a 4 yr/o & 1.5 twins. What we would like to do is put the twins on the 60% 2nd row bench with the 4 yr/o booster on the 40% 2nd row bench and be able to fold down to get to the 3rd row. Unfortunately, our current carseats for the twins are slightly (3-4 inches) too wide to allow the 40% to fold down. Anyone else trying to get 2 carseats to fit? 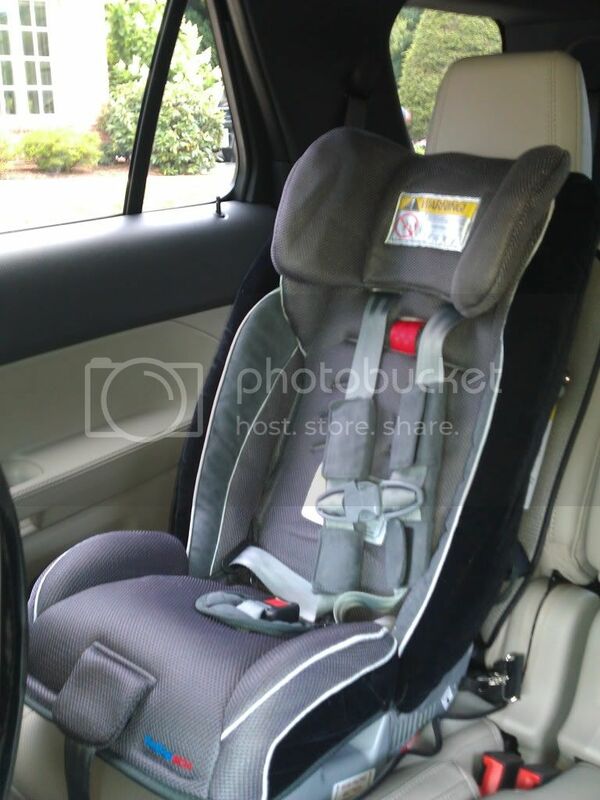 Recommendations on slimmer carseats to accomplish our goal?? I just bought a Sunshine Kids Radion80 SL, and it's very narrow. It's advertised as being able to fit 3 of them in the back seat of a standard car. Here is a pic of it on the 40% section of the 2nd row. It is very heavy, however, as it has a steel frame. Honestly these types of vehicles are terrible when it comes to 3 car seats. The only way to get to the 3rd row is to move the second row and with car seats mounted that isn't going to happen. The best solution is the captains chairs without the center console. Put the twins up front and let the 4 year old go between the captains chairs and hopefully they can buckle themselves. The next best solution is to only have 1 of the rear seats up and have the 4 year old climb in through the back. I am so glad that car seats are a thing of the past for me. I have a 14 and 16 year old and I haven't had to deal with these issues for 5 years. or probably twin in the 3rd row, and the 4yr old in 2nd row 40%. you fold the 60% to get in and out for the twin in the 3rd row... I will be in a situation similar to you and have already thought about this. I even ask my dealer if they could change my bench 2nd row to captain seats but they told me NO. Unfortunately there is only one anchor in the back. I cannot fathom why Ford did this. It's probably not wide enough to fit 2 standard car seats. I thought I saw 2 there before? I will go double check tonight. I had setup a car seat back there @3rd row passenger side couple weeks ago. There should be a rear anchor for the each of the outboard seats. We have two graco comfortsports in the center 60 for our kids so we can get the 40 down to climb into the 3rd row. You really have to work to get them together tight and into the seats tight and you have to "push" or "flex" the side of the graco car seat closest to the 40 when folding so the explorer seat doesn't hang up on the edge, rub too hard on the graco seat to pull off the padding, but it works ok. I do a hybrid attachment of the shoulder belts plus the tether over the top of the seat. I find I can get the should to tighter the bottom of the seat better than the latch, but the tether to tight the top of the seat better than the shoulder belt, plus I figure it adds a small % of safety have the two straps for the reat of the seat. I just worry about the tether crushing the top of the seat after it has been installed a long time, you get enough leverage on the tether to really crank it down. Thanks for the suggestion, harlenm! We did end up getting 2 of these and they fit fine in the 60% and the 40% folds down!!! Trick is to LATCH the outboard seat first (keep it loose but snap the latches), then fully install the middle with the 40% in partial fold position so it is known how far to go. Then fully install the outboard seat. After that I folded the 40%, climbed in back to 'attack' the top tether of the seats. On both, I routed to the outside, drivers side of the headrests rather than between the posts of the headrests. This totally firmed up the install and gave some drivers' side pressure to keep them away from the 40%. Now have an easily accessable 3rd row!!! This is an area the Ford Engineneers need to address. The strap that goes over the seat for the anchor, the leather portion is to weak and when you tigthen it down it wrinkles and flattens the top part of the seat. This portion of the top seat needs to be re-enforced with some strong plastic or metal to support the top anchor and prevent the seats from becoming worn, wrinkled, and flatten. Anyone else agree? You've all seen that commercial that says hey thats my car...referring to the second owner. Even though this is my last purchase for the next 10 years atleast!! I know this is an old thread, but as someone that has been certified to install car seats, those saying that the teather is wrinkling the top of your seats...your tether that goes over the top of the seat does not need to be that tight. It should be installed so there is no slack, but does not need to pulled tight like the anchors at the base of the seat do. Just thought I would throw that out there. I have my headrest removed and have the tether over the plastic base where the headrest inserts. No more wrinkled seats.